As we enter the second week of this new year, hope, if not energy enough, is still fresh and alive. Maybe our hopes and dreams will coalesce with God’s divine intentions for us? Perhaps this time we will stick to our resolutions, goals and plans? Or is that just wishful thinking? Maybe this will be the year when our life alters in all the best possible ways. 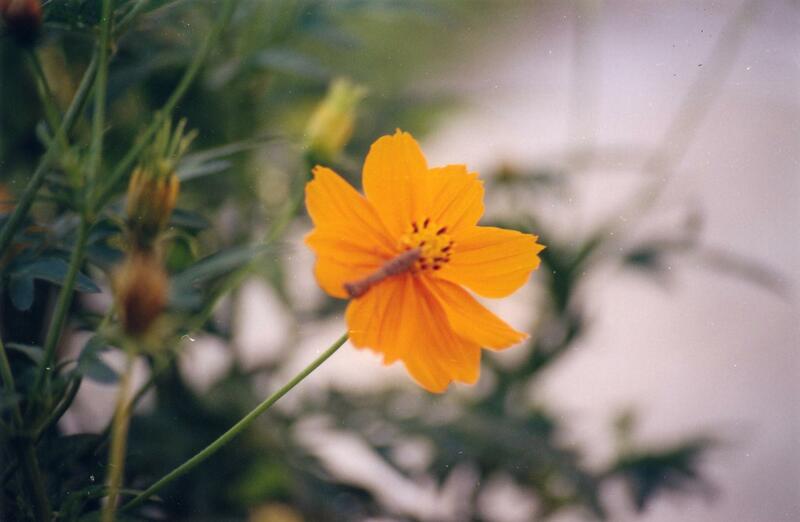 Such are the optimistic murmurings of our hearts and the fleeting thoughts that cross our mind. Because change of the positive kind is usually welcome, even when it might also bring demanding things to our attention. It helps to have one small, achievable thing to focus on as a year begins. For me, it is a yearly God-given word that suggests the theme and shape of the days and months to come. My word varies each year but every one builds on the next like holy stepping-stones. Although it takes time and hindsight to see and appreciate it. I began pondering if there was more under the surface of this delightful word than I might know as yet. In digging deeper into its potential implications, I am seeing my word “joy” as a sweet grace gift and also no less of a challenge to me than any of the rest. There are days that slip by without me being fully aware of their passing or intentional about how I spend my time. 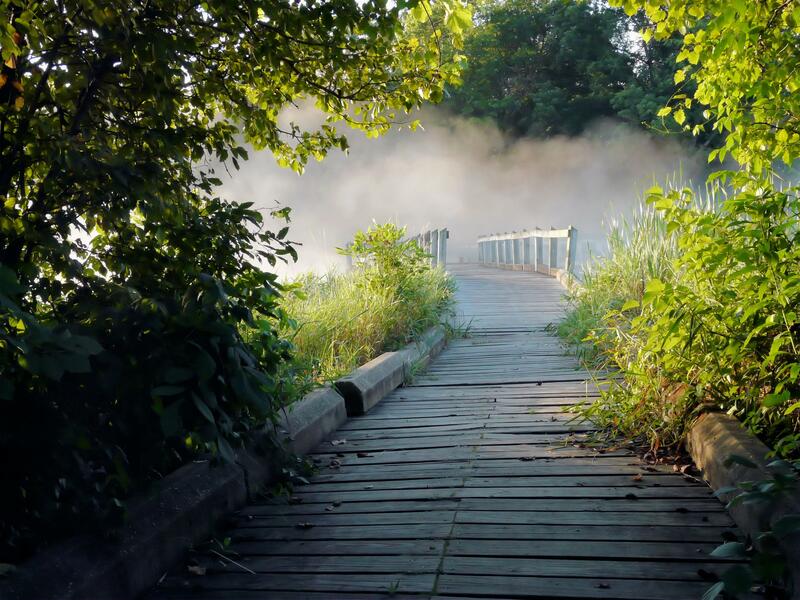 Some get lost in a fog of fatigue. Others are pervaded by pulsating pain. Many are victims of inner restlessness and inability to settle to anything much. But those in-between? Times when some energy and mental clarity are present? They lend themselves to a little more structure and goal setting. I’ve recently been trying to deliberately add some routine to a life which is far from routine. And what I’ve noticed is that nothing goes right for long without making space for sacred moments, prayer pauses and soul-sanctuary seeking. We need intimate moments alone with God. Without them we become dry, drained and depleted. We need to spend time in His Presence to rest and receive, be refuelled, refreshed and restored. Because it is better to live mindfully than mindlessly meandering through our days. 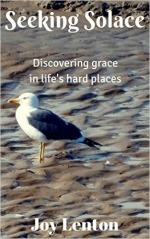 Each one is a gift of grace, even the hard ones. This morning as I flipped through my prayer journal I came across words God imprinted on my heart a while back. I’m sharing them with you today in the hope that they will bless and encourage you too. “Take time each day to commune with Me. Set apart moments to lift your heart heavenwards. For in stillness, rest and quiet lies your strength. In seeking Me, you set the tone of your day as one of surrender to My will and ways. I do not hide Myself. I can always be found by hungry hearts who deliberately draw close to My side. 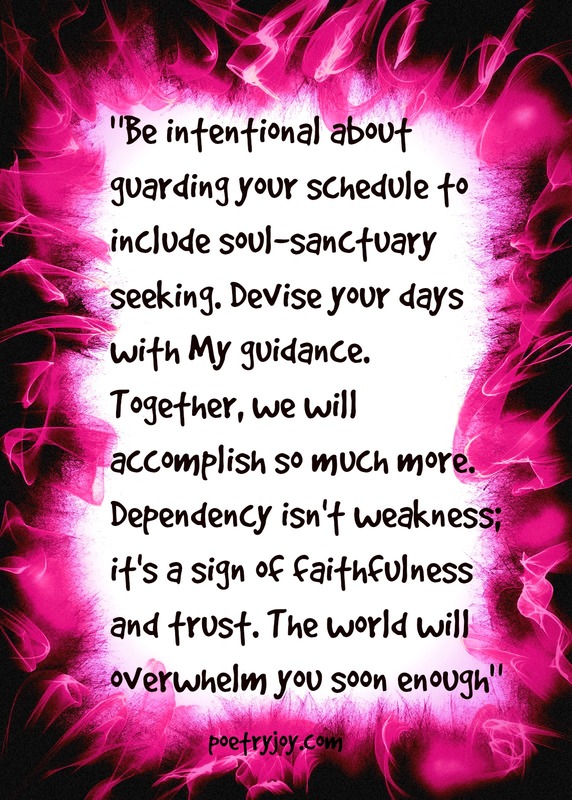 Be intentional about guarding your schedule to include soul-sanctuary seeking. Devise your days with My guidance. Together, we will accomplish so much more. Dependency isn’t weakness; it’s a sign of faithfulness and trust. The world will overwhelm you soon enough. Come to Me for inner cleansing, for deep peace and for wisdom to know how to proceed. Lean on Me and learn from Me. I am humble and gentle of heart. Let Me whisper words you need to hear. An instructed mind and tongue will become a blessing to others. Try not to rush into My Presence or hurry away without pausing to listen. I know your every need before you ask Me for anything, and My greatest desire is to have an intimate, loving relationship with you. As part of my soul-sanctuary seeking I have been revisiting ‘The Practice of the Presence of God’ by Brother Lawrence, as well as continuing with ‘Finding Spiritual Whitespace’ by Bonnie Gray, and reading books which reveal how to blend contemplation with creativity. I hope to share more as I delve deeper into these things.